I purchased these Milani Baked Blushes from Walgreens because I've been itching to try baked makeup for awhile. The colors of these really caught my eye. I ended up getting four blushes in shades Rose D' Oro, Luminoso, Fantastico Mauve and Corallina. PRODUCT DESCRIPTION: A luxurious powder blush that features a mélange infusion of colors baked on Italian terracotta tiles. Easy to use, sensorial in texture, the nuances of color become extraordinarily luminous. Silky smooth application leaves your face looking healthy and radiant all day. Available in nine shades. 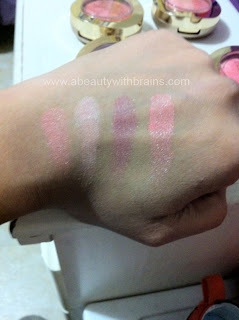 So here are the blushes I purchased..
Out of all of them, Fantastico Mauve is easily the most pigmented. With one stroke, there was great color pay off. For a everyday wear, I like Luminoso because it adds such a pretty glow even when I'm wearing very little makeup. I like all of the shades i have purchased and I would like to try out a couple more from the collection. I LOVE these blushes. My first time trying out baked products and I adore these. They have great pigmentation, blend smoothly and are long lasting (I usually wear them over my cream to powder foundation in the daytime). They are highly affordable (less than 8 dollars) and come in a variety of shades. I would definitely reccomend this product. So far I have seen the Milani baked products at Walgreens and Target. I know Cherry Culture has them online also. Have you tried the Milani baked products? I have yet to find these at my local drugstore...... oh well fantastico mauve is still calling me glad to hear you liked these. i'm going to post the ones i bought soon.. love themmm!